Florida Agricultural and Mechanical University (FAMU) is a historically black four-year public institution located on a 419 acre campus in Tallahassee, Florida. The school was founded as the State Normal College for Colored Students, and first opened its doors to 15 students and two instructors on October 3, 1887. The original school was housed in a single building on Copeland Street and offered instruction in three areas. It was designated as Florida’s land grant institution for colored people. During the 1890s the school relocated to its present location and its name was changed to the State Normal and Industrial College for Colored Students. In 1905 management of the college was transferred from the Board of Education to the Board of Control, and with this change came official designation as an institution of higher learning. Another name change occurred in 1909 when the school became known as Florida Agricultural and Mechanical College for Negroes (FAMC). In 1910 FAMC, now with a student body numbering just over 300, awarded its first degrees. That same year a fire destroyed the building that housed the library and other offices. A grant from Andrew Carnegie helped to fund the erection of a new library, which then held the distinction of being the only Carnegie Library located on a black land-grant college campus. By the early 1920s the school offered Bachelor of Science degrees in education, science, home economics, agriculture, and mechanical arts. By 1949 the student enrollment had reached 2,000, and in 1953 the institution became Florida Agricultural and Mechanical University (FAMU). Between 1953 and 1968 the schools of pharmacy, nursing, and graduate studies were created, and the student body grew to more than 3,500. During the 2008-2009 academic year FAMU enrolled nearly 11,848 students, 10,509 of whom are full time, from the United States and more than 70 other countries. About 59% of the student body was female, 41% male, and 78% were Florida residents. Ninety percent of the students at FAMU during the 2008-2009 academic year were black, 5% were white, and the remaining 5% were from other ethnic groups, with Hispanics as the largest of that number. The university offers 62 bachelor’s degrees, 39 master’s degrees, 11 doctoral programs, and comprises 13 schools and one institute. The FAMU College of Law was opened in Orlando in 2002. 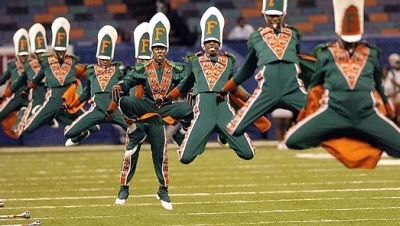 FAMU has a nationally renowned marching band and counts among its alumni Althea Gibson, the first African American woman to win the Wimbledon women’s singles crown, and Leander Shaw, Jr., a Justice of the Florida Supreme Court. Toni Hodge-Wright, The Handbook of Historically Black Colleges and Universities (Seattle: Jireh and Associates, 1992); Faustine C. Jones-Wilson, Charles A. Asbury, Margo Okazawa-Rey, D. Kamili Anderson, Sylvia M. Jacobs & Michael Fultz, Encyclopedia of African-American Education (Westport, CT: Greenwood Press, 1996); Florida A&M University Webpage, http://www.famu.edu/.